Over the course of the last couple of generations, families have gone from having seven to just one or two kids. Economics and the emancipation of women are surely to blame. Today, if you have more than two, you are unusual, four or more makes you just crazy. With four kids, everything takes a little more organisation, particularly when the kids are small. But how have we gone from viewing large families as absolutely normal to feeling quite the opposite – all in the course of a couple of generations? Our grandparents had no access to child psychologists, after-school care or fancy parenting styles. They just got on with it and perhaps so should we. The Big Discussion – Having Two, Three, Four or More??? Many consider two as the perfect number and perhaps for many it is. In my opinion, two is not enough and given the choice, I would obviously opt for four again. 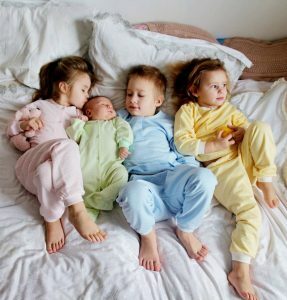 Three has always been thought of in a negative light, with the middle-child syndrome and two-against-one scenarios to worry about. I dare saying that going from zero to one was the biggest step, closely followed by going from one to two. After that, in my mind, it doesn’t really matter any longer. Whether you have three, four or more, you are going to be very busy anyway. Getting Lots of Help and Support: Especially when the kids are small, you are going to need lots of family support or even hire a nanny. If you are in the “four under the age of five brigade” it’s going to be difficult without a bit of extra help. Grandparents, aunts and uncles or hired nannies can step in when your two or four hands don’t suffice. 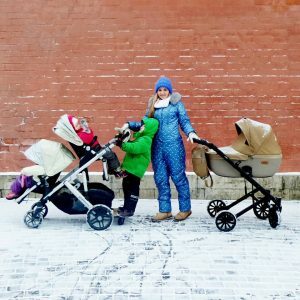 Teach Your Kids How to Do Stuff for Themselves Early: When you have three or more kids, they will have to learn how to do stuff for themselves at a much younger age. Simple things like getting dressed or making a sandwich are great skills. Once your kids are used to being a little more independent, you can relax a little and delegate. Get Your Kids to Help: Introduce chores early. Your kids will get used to helping out and this will make your life a whole lot easier. If you do absolutely everything yourself, your kids will never learn. Try to keep costs to a minimum: Raising a bigger family can have massive cost implications. Where possible, opt for deals over full priced items. Also, be sure to shop around when making bigger purchases as overspending adds up. Comparison websites like Only Reviews can help you to determine which products are worth investing in. Enjoy the Perks: Living in a house full of kids is so much fun! Every waking minute, you will experience something new. Your kids will eventually realise how much better it is to have more than just one sibling, particularly when it comes to playing games and doing stuff together. When they reach adulthood, they will enjoy each other’s support and you will be proud to have so many gorgeous adult children. Carve Out Some One-on-One Time: This might be difficult to achieve when the kids are small, however, it is essential to spend quality one-on-one time with each of your children. They will enjoy the individual attention and be less likely to seek it by misbehaving. Create Some Me/Us Time: It’s vitally important to make time for yourself and your partner. If you don’t you’ll end up tired and cranky and take it out on the kids. Make sure you have a good babysitter and hire her/him at least once a week so that you can get out., even for a couple of hours on a Sunday afternoon. Raising multiple kids is hard-work but also hugely enjoyable.